This past weekend, the Museum of Contemporary Art Chicago launched the exhibition The Freedom Principle: Experiments in Art and Music, 1965 to Now, co-organized by Naomi Beckwith and Dieter Roelstraete. An easy explication for the impetus behind the show takes the viewer to the South Side of Chicago in the 1960s, where African American artists and musicians grappled with new language and forms inspired by the black nationalist turn in the Civil Rights movement. 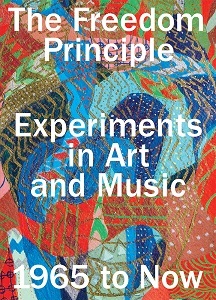 I’m plucking that line from the jacket copy, but the show (and its associated book) goes beyond cultural inventory and instead repositions the wide-ranging experimental works and the community of artists who made them in one particular canon to which they have long-belonged: the history of avant-garde collectives engaged equally in art and social justice. You can view sample pages from the book here. From a very brief description via the Art Newspaper: This year, the Association for the Advancement of Creative Musicians (AACM), an avant-garde jazz collective founded on the South Side of Chicago, celebrates its 50th birthday. Chicago’s Museum of Contemporary Art is joining the festivities with the exhibition The Freedom Principle: Experiments in Art and Music, 1965 to Now. Hingeing on the themes of improvisation, experimentation and collectivity, it . . .
From a recent piece in the New Yorker by Stephen Burt on the plight/flight of the little magazine in the digital age: Ditto machines in the nineteen-sixties and seventies, offset printing and, in the past two decades, Web-based publishing have made it at least seem easier for each new generation. In 1980, the Pushcart Press—known for its annual Pushcart Prizes—published a seven-hundred-and-fifty-page brick of a book, “The Little Magazine in America,” of memoirs and interviews with editors of small journals. 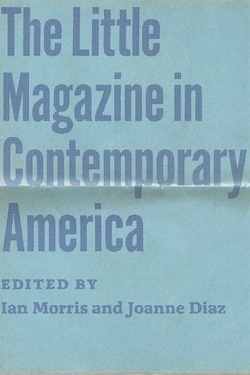 “The Little Magazine in Contemporary America,” a much more manageable collection of interviews and essays that was published in April, looks at the years since then, the years that included—so say the book’s editors, Ian Morris and Joanne Diaz— “the end of the ascendancy of print periodicals,” meaning that the best small litmags have moved online. The Little Magazine in America does indeed chronicle the history and trajectory of the “little magazine” through the past half-century of American life, from its origins in universities, urban centers and rural fringes, and among self-identified peers. Featuring contributions from the editors of BOMB and n + 1 to L=A=N=G=U=A=G=E and the Women’s Review of Books, Morris and Diaz’s collection pays special attention to the fate of these idiosyncratic cultural touchstones in an age fueled . 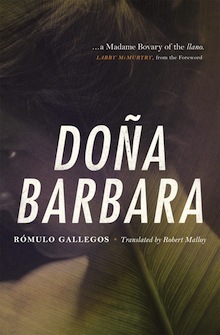 . .
Our free e-book for July is Doña Barbara by Rómulo Gallegos (“a Madame Bovary of the llano,” as Larry McMurtry hails it in his Foreword). *** Rómulo Gallegos is best known for being Venezuela’s first democratically elected president. But in his native land he is equally famous as a writer responsible for one of Venezuela’s literary treasures, the novel Doña Barbara. Published in 1929 and all but forgotten by Anglophone readers, Doña Barbara is one of the first examples of magical realism, laying the groundwork for later authors such as Gabriel García Márquez and Mario Vargas Llosa. Following the epic struggle between two cousins for an estate in Venezuela, Doña Barbara is an examination of the conflict between town and country, violence and intellect, male and female. Doña Barbara is a beautiful and mysterious woman—rumored to be a witch—with a ferocious power over men. When her cousin Santos Luzardo returns to the plains in order to reclaim his land and cattle, he reluctantly faces off against Doña Barbara, and their battle becomes simultaneously one of violence and seduction. All of the action is set against the stunning backdrop of the Venezuelan prairie, described in loving detail. Gallegos’s plains are filled with dangerous ranchers, . . .